Only 20 executive Vancouver Westside Townhomes are being featured at the ultra-luxury King Edward Green development. 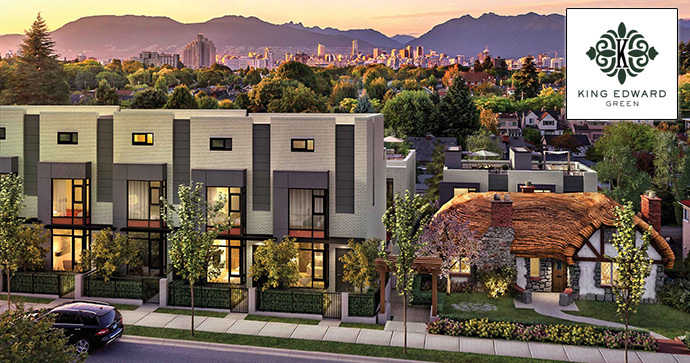 The beautiful homes along West King Edward Avenue are priced from $1.2M and are located just steps from Douglas Park and in one of the most premium neighbourhoods in the Vancouver Westside real estate district. Many of you who know Vancouver would know the site of this premium townhouse development. As part of the project, the developer will be restoring one of the most historic and beautiful ‘Hobbit House’ on the Westside. The Hobbit House is also known as the highly celebrated James Residence, and it will be part of this property along with twenty other executive Vancouver King Edward Green townhomes. One of the most amazing features is its natural setting along one of the most picturesque strips along King Edward Avenue. The impeccably designed homes will feature beautiful rooftop patios, very spacious and functional layouts as well as generous underground parking. All of this is located right in between prestigious Shaughnessy and the Cambie Village neighbourhood. Just minutes away are some of the top rated restaurants/eateries, boutique stores as well as top ranked private and public schools. This landmark community is also just minutes away from the Hospital District, West 4th/10th, Granville Island, downtown Vancouver, urban parks, Oak Street, Granville Street and Cambie Street thoroughfares. Queen Elizabeth Park is also nearby as are Oakridge Mall, VanDusen Botanical Gardens and Bloedel Floral Conservatory, False Creek and The Drive. King Edward Green Vancouver Townhomes is what luxury urban living in an established and historic neighbourhood is all about. Don’t miss out and register your interest today at www.kingedwardgreen.com. The project team for the ultra-luxury King Edward Green Vancouver Westside townhomes includes: DT5 Developments Ltd, Circadian Construction Ltd, W.T. Leung Architects In and Alda Pereira Design. You can read more about The James Residence (Hobbit House) and the ‘Storybrook Cottage’ architecture online here at: http://www.kingedwardgreen.com/history.php. This executive Vancouver townhome project features contemporary brick exteriors and is located next door to the heritage James Residence, also known as The Hobbit House. Any home owner will be treated with streets that are lined with mature trees and flower beds that lead to a modern children’s play area and a gated courtyard on the property. Some select homes will have roof top terraces with exquisite and sweeping views and all homes will have main floor and master bedroom air conditioning. 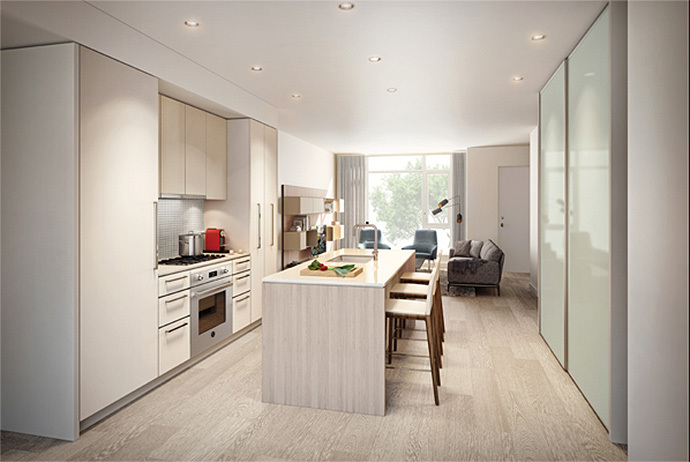 The Westside Vancouver King Edward Green townhomes will also feature open floor pans with multiple terrace decks that maximize both living space and light and all balconies and outdoor living spaces will have electrical, water and gas connections! The living, dining and kitchen spaces will have ultra wide and durable oak floors and the bedrooms have 100% wool broadloom (nature inspired) that are both durable and comfortable. The King Edward Green Vancouver luxury townhouses will all come with pre-wiring for in-home security system, low strata fees (gas is included in most homes) and the Travelers 2/5/10 standard home warranty. The project will also feature convenient secured underground parking that is accessible from every home. The kitchen features are absolutely stunning with the ability for home buyers to choose between two colour schemes (either Light or Dark). The cabinets are very modern and appliances will be integrated with matte lacquer panels for a seamless and minimalist look. The kitchens will also feature luxury polished quartz slab counters with mosaic glass backsplash in addition to large island with oak gables and cabinetry with matte lacquer doors for additional storage. The Westside Vancouver King Edward Green townhomes will also feature designer Grohe faucet with dual spray pull-out feature, contemporary stainless steel undermount double sink and eco-friendly under counter waste/recycling organization system. The appliance package included with your purchase of a luxury King Edward Green Vancouver townhome includes a Fhiaba 30” fridge integrated with matte lacquer panelling, Energy Star rated 24” Blomberg dishwasher that is also integrated, Bertazzoni 30” stainless steel drop on low edge gas cooktop and a Bertazzoni 30” stainless steel convection oven with LED display. The bathrooms at the King Edward Green luxury Vancouver townhomes will feature stunning polished marble counters in the master ensuite, natural granite and quartz counters in the powder rooms and secondary bathrooms in addition to elegant custom cabinets that are wrapped in modern white oak wood veneer. Other bathroom features include Grohe Essence “ECOJOY” chrome faucets, Euro style Grohe shower head with additional triple-component faucet in the master ensuite and sleek under mount sinks in bathrooms, with above counter rectangular Duravit sink. Other bath features include high efficiency dual flush toilet by Toto, luxurious spa like bathtub and spacious full sized walk in shower with frameless glass enclosure. The luxury Vancouver King Edward Green townhouses also come with luxurious large format porcelain tile floors and sleek rectangular wall tiles unified with the floors. Please note that all the specifications are subject to change at any time. Here are some of the spacious draft layouts featured here at King Edward Green Townhouses in Vancouver: The Prince is a 3 bedroom and 2.5 bathroom layout along Ash Street (between 1467 to 1646 square feet) and The Earl is between 2015 to 2089 square feet featuring 3 bedrooms plus suite and 3.5 bathrooms. The Baron floor plan is a 3 bed/2.5 bath floorplan between 1498 to 1574 square feet. The Duke 1 is a 3 bed plus media room and 2.5 bathroom unit layout between 1688 to 1751 square feet while the Duke II is 1796 square feet. The Duke layouts face West King Edward Avenue while The Earl layouts face the Laneway.